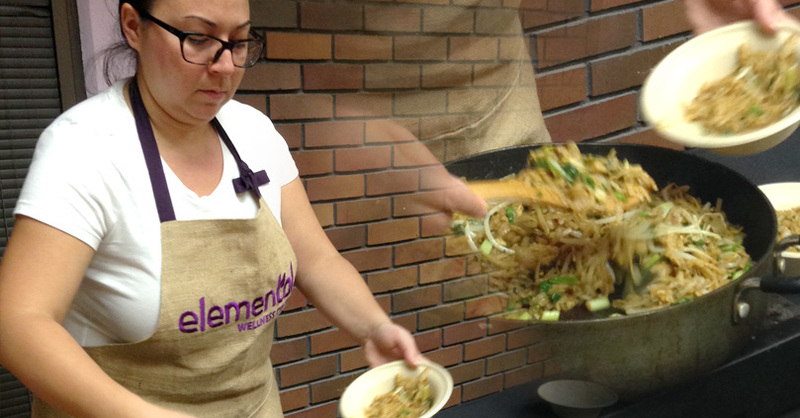 Elemental's weekly cooking class continued this past Tuesday, as Chef Jeni instructed the class on how to whip up some delectable medicated Pad Thai. Students were treated to Jeni's West Coast spin on this quintessential Thai dish, which includes 200-300 milligrams of One of A Kind Elemental True OG Olive Oil. "The taste of olive oil with True OG extract works well," Jeni said. "There's not as strong of a cannabis taste as with some other products." From cooking the noodles to adding the medication, Jeni guided students through the entire culinary process, adding several helpful tips along the way. "Lime or fresh ginger refreshes the palette," Jeni said. "In Thai cooking, we use lime to make sure things blend together better." While the flat noodles began to sizzle in the frying pan, Jeni answered questions from the class and started to mix the sauce--a flavorful combination of soy sauce, ginger sauce, and apple cider vinegar. Once the noodles were finished, she added the sauce and True OG Oil, and began to stir. Jeni advised students to remain mindful when distributing the oil throughout the dish. "We don't want to smush anything," she said. "But also make sure certain parts aren't more concentrated [in Kind Oil] than others to avoid over-medication." After Jeni finished mixing the ingredients, individual servings were portioned out and given to students to take home and sample. Jeni was right: The "green" taste was hardly detectable in the final product, but the True OG's couch-locky, pain-relieving effects were unmistakable. It made for the perfect post-work meal to ease into the end of one's day. Interested in attending next week's session? Classes are held every Tuesday at 5:30 p.m., and, as always, are free to Elemental members. Be sure to bring plenty of questions--the course is interactive and ample time is allotted for discussion throughout. Also, the lesson is conveniently held during Tasty Tuesday, so there's no excuse not to stop in and see what the hype is about!